We’ve had a fabulous weekend in NYC. Jon’s up here – technically – for some work stuff, so I tagged along and we’ve spent the weekend doing a whole lot of nothing. 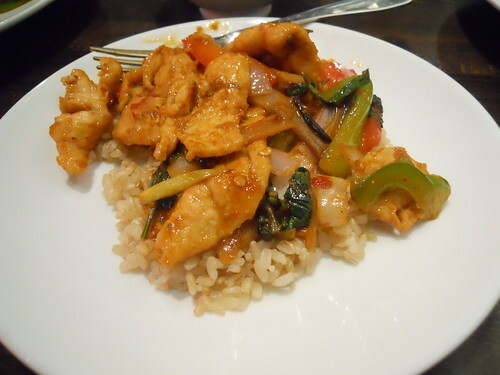 I’m trying not to go crazy with the eating … and have tried to incorporate some exercise. I think I’ve been somewhat successful. It’s hard. I will NEVER view food simply as fuel. I love everything about it. 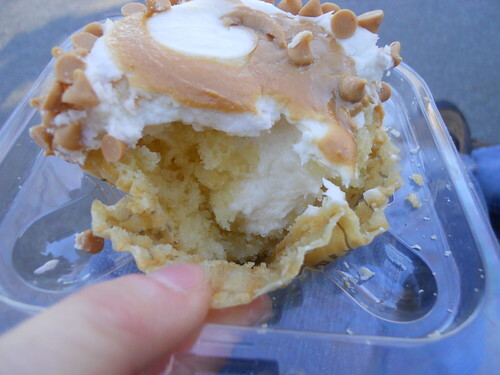 I think I’ve come to terms with the fact that I can’t eat whatever I want, whenever I want it … but I’m just never going to be able to swing so far that I’ll pass up a chance to eat a fabulous cupcake. 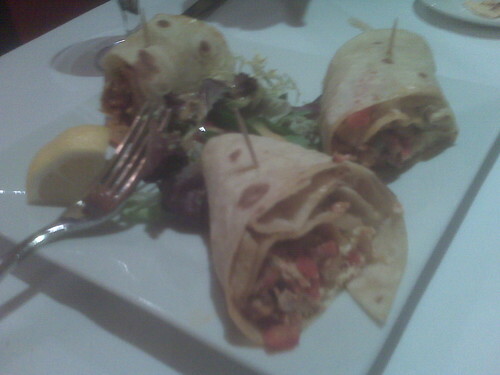 We were still at a hotel in New Jersey yesterday morning, so we ate on the way out. 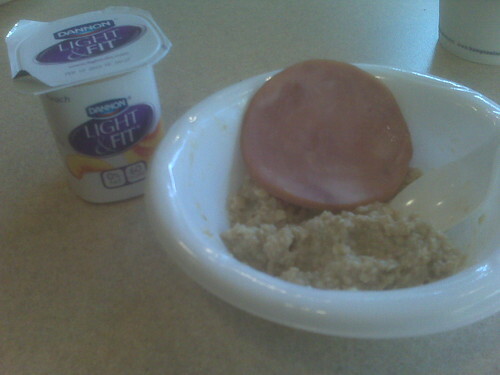 Yogurt, oatmeal and a piece of ham, for me. I had a moment of guilt and thought about all of the sugar I was consuming – and the crap I know I consumed from that ham, but … eh. It was this or nothing. 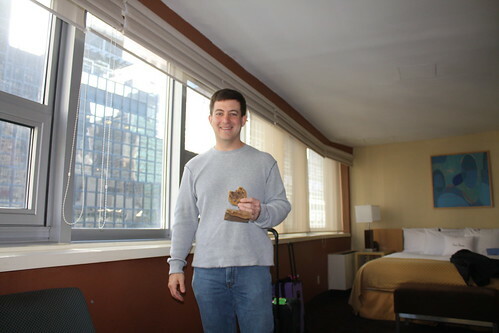 We were very close to NYC, so we made it here quickly and checked in early. And look! Jon’s eating CARBS! I caught him. We walked what seemed like 40 miles before stopping for lunch at a small place – can’t remember where or what. 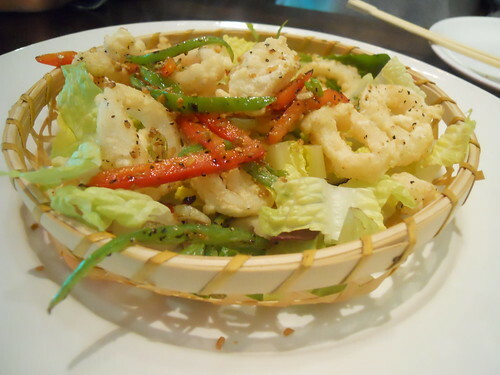 We split a peppercorn squid appetizer and split a thai basil chicken (with brown rice) entree. 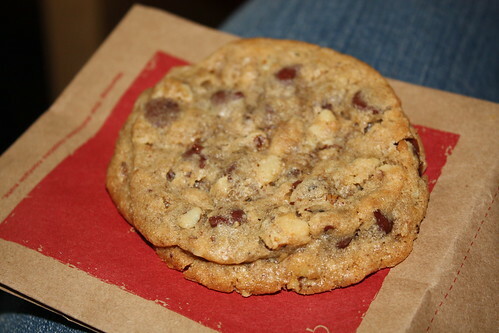 Then … we passed a Crumbs. Had to go in. 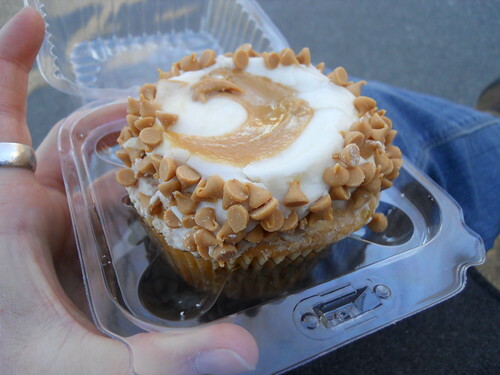 I chose the cupcake of the month – Elvis (Vanilla cake filled & frosted with banana cream cheese frosting, topped with a swirl of real creamy peanut butter and edged with peanut butter chips.) Best. Cupcake. EVER. 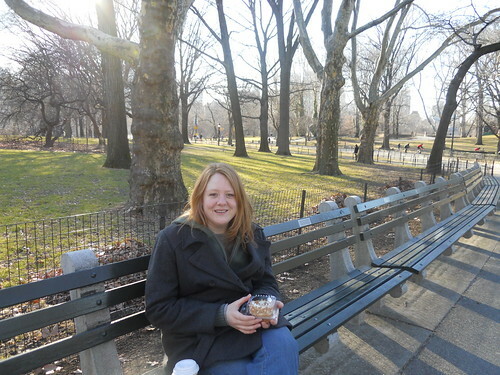 We went to the park and sat and ate (about half because damn was it rich) and watched people. 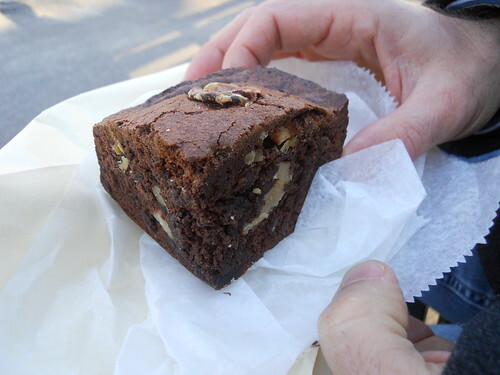 Jon got a brownie that’s still sitting in our hotel room a day later, which – in my life – translates to Not So Good. Yes, I fully realize I will happily spend over $10 on cupcakes/brownies but (!!) over $15 skin stuff. I have priorities. 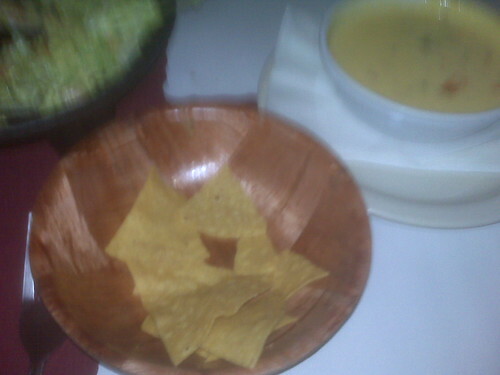 I wanted Mexican food for dinner, but I didn’t want to get dressed up, didn’t want to wait in line, didn’t really want to deal with noise and people … so I looked around on yelp until I found a place someone described as a “great little dump” and we headed there. I am still paranoid about taking pictures … and this place was TINY, so I didn’t take any. I tried to take one with my phone, but the flash went off and I panicked and just quit. I don’t know why I have issues with this, but I do. 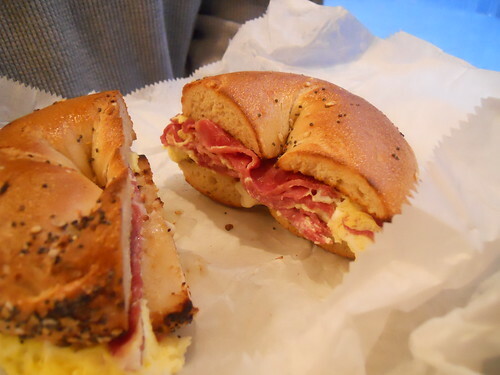 This morning, I required a bagel … so we went to Ess-a-Bagel for breakfast. 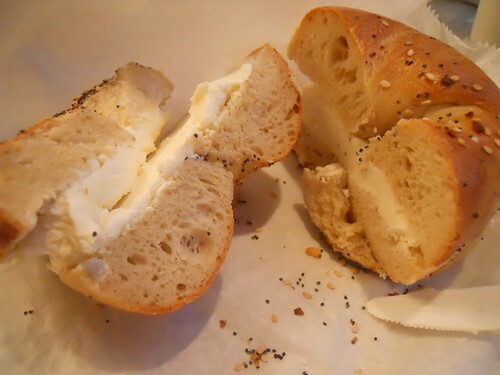 I had an everything with cream cheese. Jon had egg and corned beef on an everything. 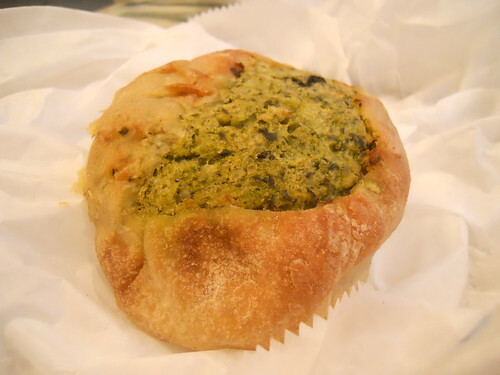 We split a spinach knish (I had maybe one bite – the bagel/carbs fill me up quickly). 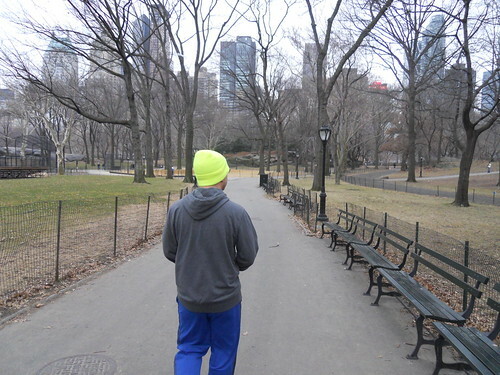 Shortly afterward, we changed and then walked 11 or 12 blocks to Central Park to do my day of C25K stuff. It was cold and started to rain a little, but it was fun. This is pretty much what I see each time we do this – Jon’s back, with small spurts of “come on” and “it gets better” interspersed here and there. 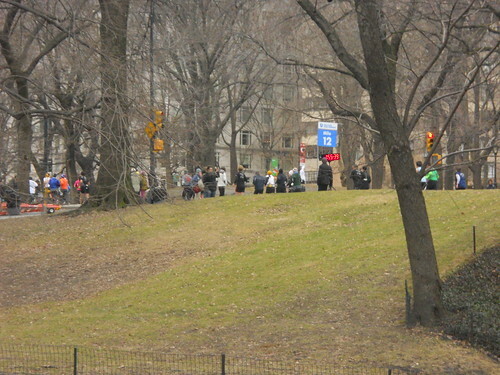 There was a race of some sort going on, so there were hundreds of people out running. Here they are at mile TWELVE as I was dying just 3 minutes in. I hope this gets better. Right now? Not loving it. I’m committed, but damn. 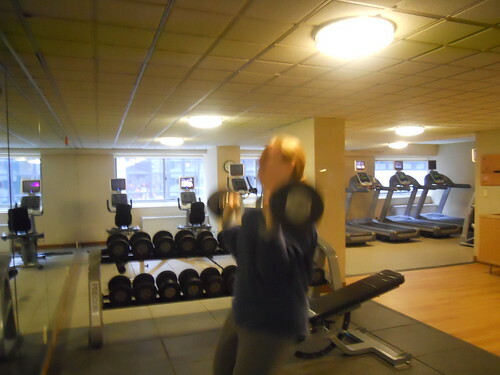 We took advantage of the hotel gym when we got back. Jon had me do some stuff he learned at crossfit. I don’t know what, but it was some sort of squatting and lifting that I’m too lazy to look up. I started with 35 pounds, moved up to 45, and could lift 55 just once with any kind of (relative) ease. 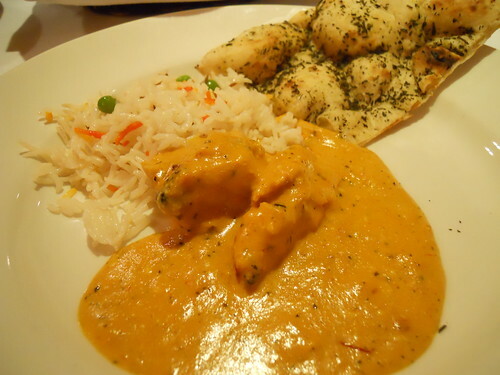 After THAT, we went to lunch at a place near our hotel – Bombay Bistro. Best meal and service we’ve had this weekend, for sure. 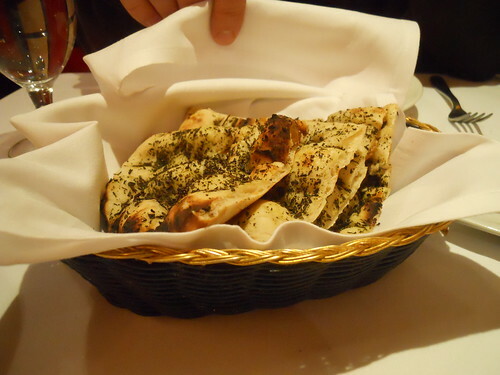 We split the Calcutta Kathi Rolls appetizer (chicken tikka in egg coated roti) and split the chicken zaffrani entree (chicken & saffron sauce) … and had the rosemary naan. AND our waiter brought us a complimentary dish of rice pudding that I didn’t take a picture of because he was nearby the entire time and – as I’ve said – I’m weird. We’re having something delivered tonight. I want to go to NYC!!!!!!!!!!!!!!!! Jealous!! 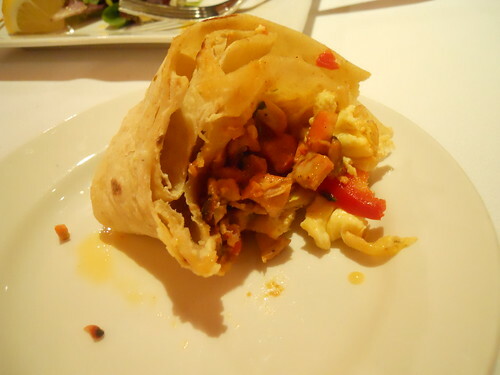 Best food I have ever had was in New York and Germany! Glad you and Jon had fun. Have fun on your next trip too. We are all keeping an eye on you know who here. She has pile of movies. Thanks! And thanks for the movies, etc … I know she really appreciates it. I do, too!